The book is up-to-date and is very well written. Everything is thoroughly explained while also making the lecture interesting by adding a side-joke every now and then. The pre-chapter and post-chapter quizzes are a good measure of "what you knew before" and "what you know now"
Practice test engine doesn't work, despite attempts by technical support to get it working. PDF is OK, but if you're buying for the practice test engine, then forget it. 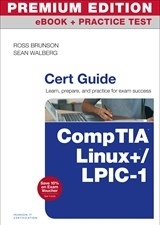 I did bought the LPIC-1 eBOOKS and currently I 'm learning for the exam. I found the eBOOKS & the exams preparation very good and I hope to approach the exam soon. Even I did encountered problem to activate the exams I got professional help from the customer support. Seems to cover the objectives. Decided to start however with Linux Essentials to really start from the basics.